【化学】 イットリウム 《希金属元素; 記号 Y》. From Ytterby, (字義どおりに, "outer village") a town in Sweden, +‎ -ium. A metallic chemical element (symbol Y) with an atomic number of 39. Yttrium ( /ˈɪtriəm/ it-ree-əm) is a chemical element with symbol Y and atomic number 39. It is a silvery-metallic transition metal chemically similar to the lanthanides and it has often been classified as a "rare earth element". 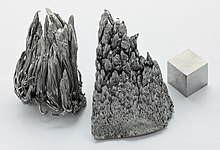 Yttrium is almost always found combined with the lanthanides in rare earth minerals and is never found in nature as a free element. Its only stable isotope, 89Y, is also its only naturally occurring isotope.